BlackBerry (BBRY) has been a big disappointment for investors over the last three years. Despite period stock price bursts, the company fails to live up to investor expectations and the stock price falls back again. The company has been in the restructuring mode for a very long time now, as it looks to replace its declining smartphone revenues with other products and services. Despite the new management changing its focus to software, the company still has not jettisoned its smartphone hardware business that continues to go downhill. The new CEO Chen has been quite good in his performance, as he cut down on the cash burn and returned the company to profitability. He has reduced the costs by also partnering with Foxconn to produce and market BlackBerry smartphones. But the company’s strategy is not still clear. If it wants to be a pure play software player, then it needs to sell or exit smartphone hardware. If it wants to be a provider of secure mobile operating system, then it needs to partner/sell itself to bigger smartphone hardware manufacturers such as Samsung or Lenovo. BlackBerry is becoming more and more irrelevant to the consumers today. Even for corporate customers BlackBerry is not the first choice anymore, as many useful apps have skipped the BBRY operating system because of its low installed base. I continue to think that the best option for BBRY is to find a buyer in order to survive. No western mobile company has managed to survive the smartphone transition except Apple. I don’t think that BBRY will be the second exception. I would continue to avoid BBRY for now. Even as technology stocks make new highs almost every day, BBRY has been stuck in a range for almost three and half years. Some sharp traders might have made money using the stock’s high volatility, but for investors it has been a dead investment. The problem is with the company’s strategy. It is trying to do too many things, despite its small size and lack of resources. It is playing all 3 technology segments – software, services and hardware. There are not many technology companies that have managed to successfully operate in all these three segments. Apple is perhaps the only one successful in all three. The others have either subsidized one segment, or have lost tons of money and exited. BlackBerry with its puny size is not in a situation to subsidize anything. I don’t think that the company still has a clear strategy on what they want to do. It is trying too many things without having the resources. They need a clear focus on what they want to do and put all their money and management bandwidth into it. The overall marketshare of BBRY keeps going down, but the company still has not got out of the hardware space. Though the management has managed to stem the massive losses, I still don’t know where they want to head with this thing. If they want to be seen serving the enterprise market, then they should just stop selling through the retail distribution channels and focus their money and effort in serving the enterprise market. I live in India and even people who like BlackBerry are moving to iPhone in the corporate segment. The reason is that a lot of common apps do not work on BBRY, as even major companies find porting apps for BBRY as waste of time. For example, Ola Cabs (funded by Softbank and similar to Uber) which is a very popular taxi app in India does not work on BBRY. Getting a BBRY smartphone serviced has also become an issue. 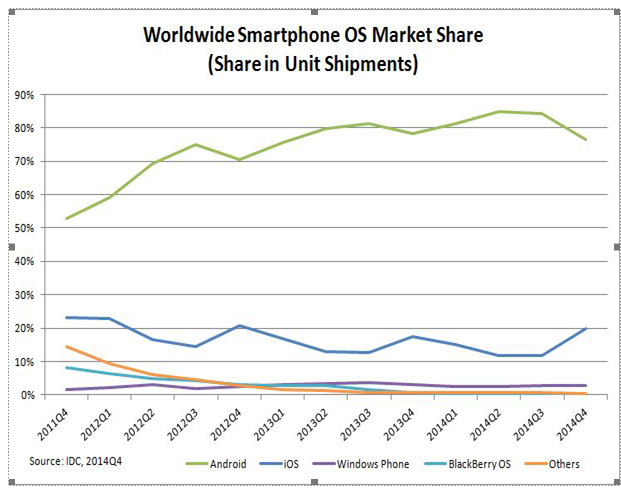 I think BlackBerry is also finished in its strong markets like India and Indonesia. No one is interested in BBRY anymore and people think that you are old fashioned if you own a BBRY these days. In contrast, new launches by Acer and Xiaomi generate a huge amount of excitement. OnePlusOne has started to get iconic status amongst tech savvy consumers. I think Leap positioning makes no sense at all. It cannot compete in the consumer segment and corporate customers can afford a smartphone with better specs and a higher price. Leap will be launched at a price of ~$275 which is comparable to the Xiaomi s Mi4i smartphone price. Based on specifications, Leap is far behind Xiaomi Mi4i in camera resolution, screen clarity, weight and process. Leap has to be far better in OS and apps than Mi4i, in order to make up for its inferior hardware. People might argue that BB10 OS is better than Android 5, but BlackBerry is definitely far behind in the apps availability. The argument that Android apps can easily be ported to BB 10 is a myth. Most of the times, Android apps do not work on BB 10. Upgrading these apps is also a tedious process. New phones by Xiaomi get sold out in minutes in major online portals. BlackBerry’s marketshare has gone down from an inconsequential 0.6% in Q4 2013 to even more inconsequential 0.4% in Q4 2014 (down 70% y/y). If you take a slightly longer 3 years financial view of BBRY, you will see a company in a meltdown. Its revenues have decreased by ~70%, while book value has gone down by ~60%. The company has lost money in the last three financial years, though it posted a profit in the last quarter. It posted a meagre profit of 4c/share after a number of loss making quarters. The company had a lot of cash on its balance sheet earlier, but that cash has been burned down. Now there is only ~$1.2 billion of net cash, which is around ~20% of the company’s market capitalization (~$5.4 billion). Though the company does not face any solvency issues, it does not a have a great valuation support either. BBRY has failed to find a buyer despite numerous rumors. Even the top management is trying themselves to sell the company, for a few months now. In my view, a buyout is the only way that the stock can make money. I do not see the company making sustainably large revenues and profits on its own, given the current scenario. The company’s service revenues has kept declining at an alarming pace. The service revenues fell again by 16% q/q and are expected to keep declining. Service revenues make up 47% of the overall revenues and BBRY will have a tough time in replacing those revenues from the software segment, which it is still ramping up. The company’s service revenues going down is more or less certain, but its software revenues going up is uncertain. BBRY will have a tough time in maintaining its revenues at the same level. And any update on the service outlook for 2016 through the balance of the year. It sounds like consistent 15% declines on a quarterly basis? Yes, that’s why we are modeling, yes, I think that’s a reasonably good number. Smartphone segment turns around – BlackBerry is pushing hard to increase its annual sales of smartphones to the 10 million number, by launching new models like Leap. This will give the company enough volumes to make the smartphone hardware reasonably profitable. Given the massive size of the smartphone market, this is not a very hard thing to do. However, the network effects of Android and iOS have become too strong and even stronger companies like Microsoft (MSFT) and Samsung are not being able to increase their smartphone OS marketshare. Software sales growth – BBRY software sales increased by more than 20% q/q to $67 million in the past quarter. The company is pressing very hard to increase software sales by focusing on partnerships with major technology companies like Samsung and Google, as well as targeting high growth areas such as MDM and IOT. BlackBerry has a market valuation of ~$5.1 billion and trades at not so cheap valuation, with a P/B and P/S of 1.5x. The stock is currently trading at ~$10 which is near the midpoint of its 52 week price range. The company’s stock price has been stuck in the ~$5-15 range. While, some investors can say they have not lost much money in BBRY, the opportunity loss has been quite large. If you had invested in the NASDAQ in the beginning of 2012, you would have got a ~90% return. I think that the risk reward proposition of BBRY is not too favorable. The company’s steady decline in the smartphone hardware and service segments is alarming. The new management’s focus and results in the software segment has been quite good. But I don’t think the software revenues/profits can be ramped up fast enough, to stop the hemorrhage in the other two segments. The company faces two big risks in increasing software and smartphone hardware sales. I think the best option for the company’s investors will be if the company sells itself, however this option has not fructified despite management efforts in the past. I would avoid BBRY stock and look for more fundamentally strong stories in the technology space.